Join experts Tara Twomey and Thad Bartholow in a discussion regarding Ditech consumer claims. You will learn how/where to file claims; the bar date; the entire list of entities involved; why your client may not have received notice and what to do about it; what the proposed plan does and doesn’t say; and more. 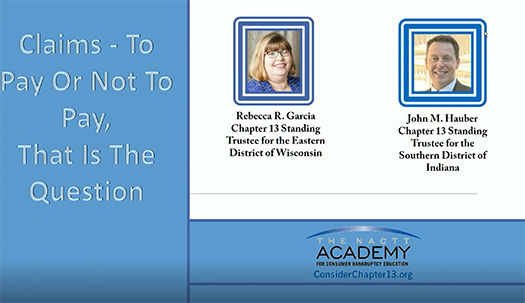 Chapter 13 Trustees John Hauber and Rebecca Garcia examine legal theory of what is a claim, what are the trustees duties regarding late filed claims, stale dated claims, claims vs. the plan, and adequate protection payments. Chapter 13 Trustees Debra Miller and Russell Simon are joined by John Rao of the National Consumer Law Center. Discussion topics include, not only the new mortgage statements (rule effective April 19th), but also new RESPA party in interest issues, pointers as to what to do when the statements bare no resemblance to the trustee’s records, and reasons for mortgage coding. This webinar is advanced level and directed specifically toward conduit Trustees and Trustees’ staff; however, mortgage creditors/ servicers and debtor attorneys will also benefit from this presentation. Mary K. Viegelahn, Trustee moderates an in-depth discussion with Deborah B. Langehennig, Trustee and Todd Malaise, Debtors’ Attorney on the issues involving excess disposable income beyond the amount necessary to pay all creditors in full and how far a court can go to place conditions on confirmation of a plan, including a discussion on how courts have ruled on this issue. This is an advanced level webinar. Attorney Brent Meyer moderates an excellent one-hour discussion on new and existing loan modification programs throughout the country. Experts Robert Branson and Tammy Branson update attendees on options available to clients right now and how to navigate the application process. This is a moderate to advanced level webinar directed primarily to attorneys who represent debtors. The Academy is pleased to present this 60-minute webinar by Professor B. Summer Chandler of Georgia State University College of Law and Attorney Phil Lamos, Chief Legal Counsel to Chapter 13 Trustee Craig Shopneck. This is an excellent ethics program on how to navigate social media. They answer questions such as: Do attorneys/trustees have a duty to investigate the online presence of debtors? 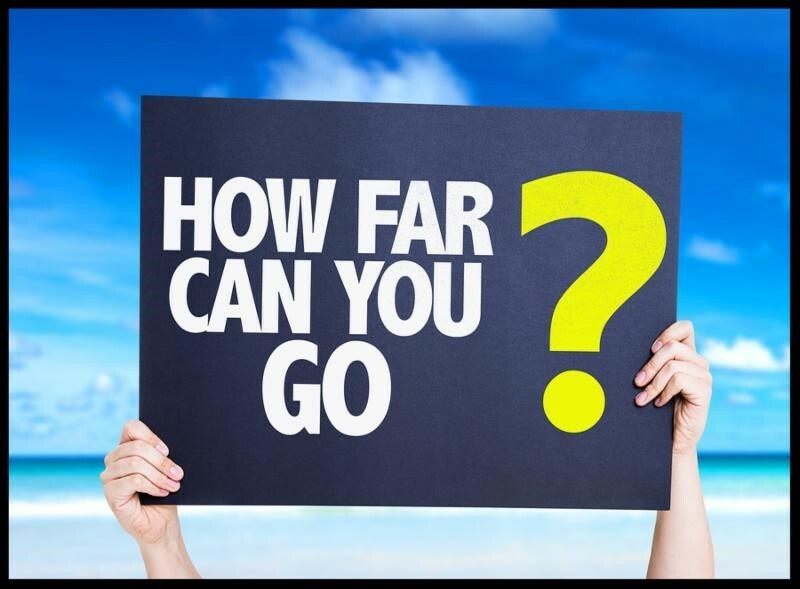 How should/must an attorney respond to statements made by clients online? And more. Chapter 13 Trustee Debra Miller and expert Michael McCormick will bring us a practical outline on how to review those pesky escrow statements and what to specifically look for in the second year of bankruptcy. In this advanced level, one hour presentation, experts Craig Shapiro and Jon Taylor, with moderator, Larry Ahern, examine the Spokeo decision, elements of constitutional standing, concrete harm, FDCPA, TCPA, issues the decision addresses and what it does not address. Join passionate blogger Cathy Moran for an excellent, 58 minute tutelage on creating your own web content, where to get ideas, and how to get started. Learn how to draw clients to your practice by maximizing your website. This webinar is entry level and directed toward all attorneys and office managers. In this excellent 90 minute presentation, experts John E. Waites, Judge United States Bankruptcy Court for the District of South Carolina; practitioner Lewis Roberts from Altamonte Springs, Florida; and Chapter 13 Standing Trustee Laurie Weatherford discuss options regarding student loans: Chapter 20, mediation, separate classification, and MORE. Join marketing experts Carmen Dellutri and Cathy Moran to learn tips on how to market yourself and your law firm. Both Dellutri and Moran are Certified practitioners in consumer bankruptcy law. Each has grown their practice exponentially through various marketing techniques. Join tax expert Morgan King and Chapter 13 Trustee Al Russo for a 65 minute discussion on changes in how taxes are dealt with in some bankruptcy cases. Trustee John Gustafson and Debtor Attorney Mark Leffler will not only discuss the advantages of the Chapter 13 option but will also explore the Chapter 13 ‘Super Powers!’ – The Co-Debtor Stay, Stripping Wholly Unsecured Junior Mortgages, Retaining Non-Exempt Assets, and more. Join Judges Paul Bonapfel and Stanley Birch, along with experts Lisa Ritchey-Craig and Michael Holbein, for practice pointers, advice on what to include (or not) in a brief, and a rare behind the scenes look at the appellate process including tips on oral argument. A continuation of Demystifying Mortgage Escrow, this resource drills down beyond the basics and analyzes common problems found in deciphering escrow statements. Experts Ramona Daniels, Joel Ackerman and Denise Carlon look at case law and statutes and answer viewer questions. 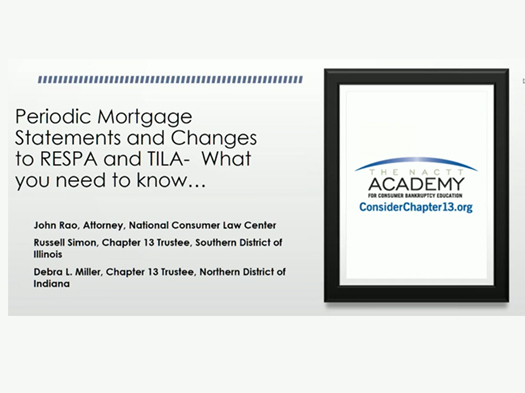 Join Chapter 13 Trustee Tom King, attorneys John Crane and Wendy Walter on a voyage through selected portions of the new Mortgage Servicing Rules promulgated by the Consumer Financial Protection Bureau resulting in significant changes to Regulations X and Z. These rules go into effect January 10th. In Escrow Analysis 101, Michael J. McCormick and W. Jeffrey Collier do a stellar job of helping us understand an escrow analysis and how to use the information contained in an escrow statement. This webinar is specifically designed for trustees’ and debtors’ attorneys’ staff, but could also be of assistance to anyone required to analyze escrow statements and resolve problems short of litigation. Legitimate Challenges and Counter Challenges to Mortgage Claims.